ASIA/BANGLADESH - The police: no seizure, Fr. Rozario is "mentally unstable"
Cardinal D'Rozario: "Proclaiming the Gospel to the poor is priority"
Cardinal D'Rozario: "The care of children is a pastoral priority"
Natore (Agenzia Fides) – There is mystery regarding the Catholic priest kidnapped and released in Bangladesh. As Agenzia Fides learns, Fr. William Walter Rozario is accused by the police of having somehow staged the kidnapping and having moved away from his diocese alone, because considered "mentally unstable". The paradoxical version of the police forces, who are still keeping Fr. Rozario in custody, was presented at a press conference held today in Natore where the priest was present without the opportunity to say a word and give his version of the facts. Everything will be clarified on Monday, when Fr. Rozario will express his testimony in court, before a district judge. Subroto Purification, parish priest of the church where Fr. William was vice-parish priest in Bonpara, in the diocese of Rajshahi, is visibly surprised and disappointed by the "absurd conference held by the police": "We are literally without words. What the police say - he says to Agenzia Fides - does not stand up. Why would William have to do this? We were organizing the pilgrimage of the faithful to Dhaka, and he too could not wait to meet the Pope. The staging is an unfounded hypothesis, as well as the mental illness. We do not know what it is based on and we hope everything can be clarified in court". Another local source of Fides notes that "unfortunately in Bangladesh this is a way to cover the responsibilities of the state, which cannot guarantee security to citizens" and notes that "episodes like this can also be a symptom of widespread corruption in the State appartatus". 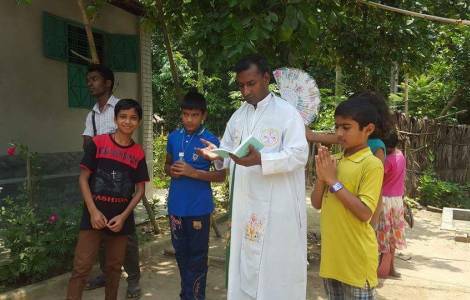 As Agenzia Fides learns, the Bishop of the diocese of Rajshahi, Gervas Rozario, is in Dhaka, where he had gone for the arrival of Pope Francis and in the coming days will return to the diocese. The Church of Bangladesh is ready to fully support Fr. William. "We are waiting to hear his version and understand what he will say. But we are completely convinced that he was kidnapped, in unclear circumstances", concludes Fides source. William Walter Rozario had disappeared last Monday in Bonpara, in the district of Natore, in the northwest of Bangladesh, and was found by the police in Syleth, a metropolitan city in the northeast of the country, at the border with India, about 400 km away from his residence, in the diocese of Rajshahi. He was in charge of Saint Lewis school and, in the last period, was busy organizing the trip of about three hundred faithful to Dhaka, on the occasion of Pope Bergoglio’s visit. According to the hypotheses circulating among the Bangladeshi Catholics, the kidnapping could be the work of Islamic extremist groups, who seek visibility or intend to scare Christians; could be linked to the work of Fr. William, headmaster of a Catholic school; or it could be due to common crime, purely for the purpose of extortion. AMERICA/EL SALVADOR - The Archbishop of San Salvador: "No to the 1993 draft law, yes to true national reconciliation"
AFRICA/CAMEROON - Release of kidnapped Claretian missionaries: "Our thoughts went to our martyrs"